Spoiler: Writing with ink on paper is still way better than stabbing at a hard glass screen with a soft rubbery tip. Double spoiler: writing with a ballpoint pen which records your every stroke for searching and editing on your iPad is amazing, and way better than taking photos of every page you finish just to feed into Evernote. Third spoiler: No matter how good the hardware and the AI behind the scenes, a crappy app lets everything down. 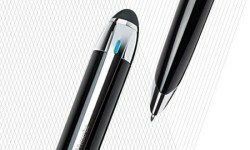 The Livescribe 3 is the new iOS-friendly Smartpen from Livescribe, communicating with your iPhone or iPad via Bluetooth direct into the companion Livescribe app. 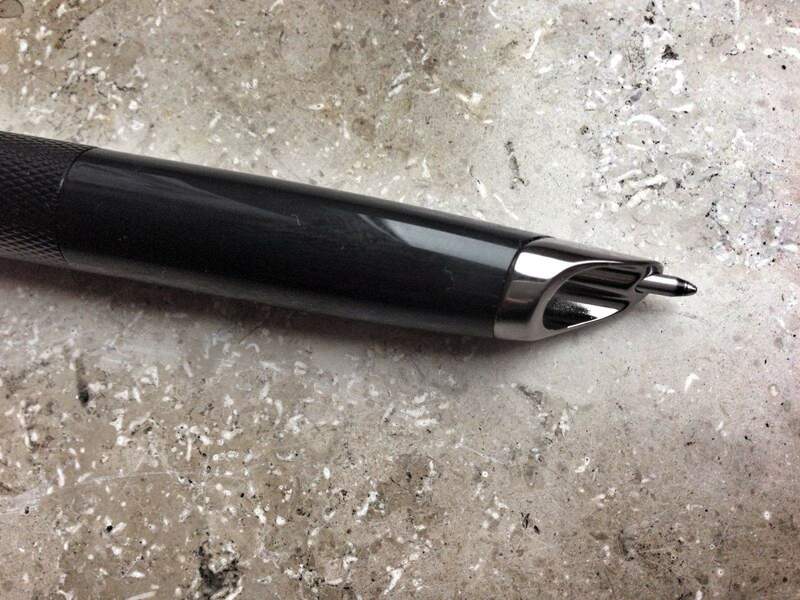 The pen uses a regular ball-pen tip, and hidden inside the fat barrel is a camera which tracks the pen as you write. It only works on Livescribe’s special paper, which is covered in an almost invisible pattern of tiny dots that let the pen keep track of it. Fortunately this paper is cheap, and comes in many forms – even Moleskine-like journals at not much more than Moleskine-like prices. You can also print your own paper if you use a 600dpi laserjet printer. The pen itself is a joy to use. 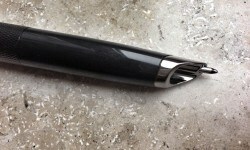 The pen switches on with a twist of the barrel, and status lights let you know what it’s doing. You only need to pair the pen once, in the app, for it to be automatically recognized in the future. 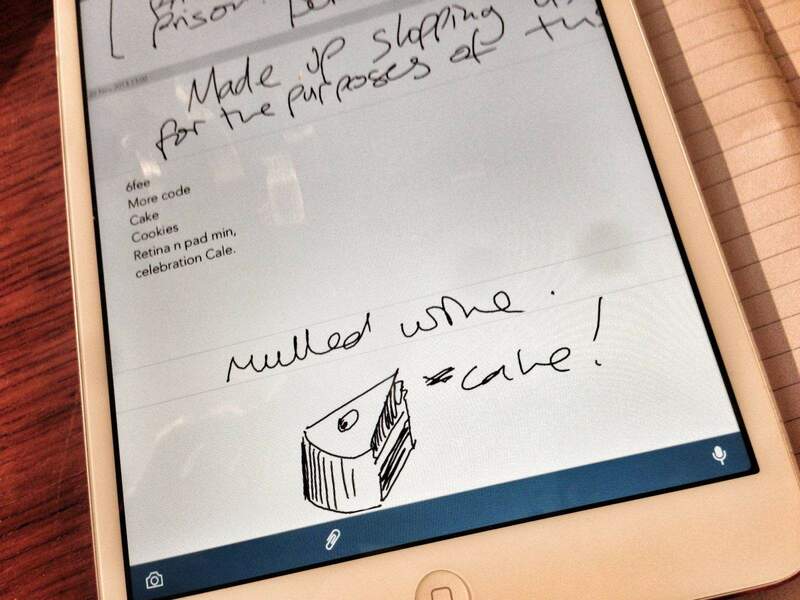 You can write on paper and watch the progress in the app as you go. It’s spooky seeing the words and doodles appear on screen as you scrawl on paper, but even cooler is just leaving your iDevices in your pocket and going old school, writing on pen and paper. Then, when you open the app, all your work is instantly transferred. Charging is done via a microUSB port hidden under the rubber “eraser” at the top of the pen (it’s actually a capacitive stylus for drawing on-screen, and although it works fine it’s too fat to really be useful), and… Well, that’s it. The hardware is as simple as an actual pen. Like I said, there’s nothing quite like writing with an actual pen and paper, and that’s really all the Livescribe is when it comes to using it. The ball is smooth, the pen works just fine, and its fat barrel makes it comfortable in my big hands. The Lady found it too big, but she’s also hyper critical of gadgets so you should bear that in mind. I thought that switching the pen on and off would be a pain, but as you have to twist the barrel to get the pen out anyway you can’t really forget to do it. And the Moleskine-like notebook that comes in the $200 deluxe set is very nice indeed, and just like the kind of books I’d use anyway. Talking of books and paper, the pen doesn’t just write and draw. 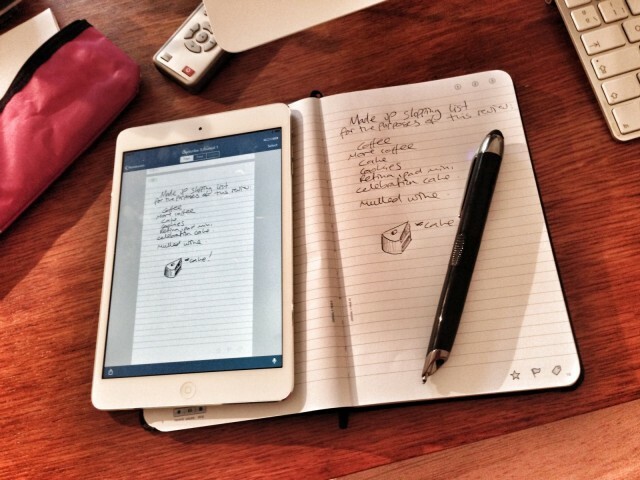 The Livescribe paper has a couple of icons you can tap with the pen’s nib to get extra functions. You can kind of tag your work, by tapping a star, a flag or a tag, and you can record sound by hitting the record/pause and stop symbols on the bottom left of each spread. Recording seems to work just fine, and has the rather excellent feature of being synced to your written words. So, if you take notes during an interview or a lecture, you can just tap a word in the notes and the relevant part of the audio will be played back. I have little use for such a thing, but I can see how totally useful it is. And the app uses your iPhone or iPad to do the actual recording, so you have everything even if you lose the pen. And if you do lose the pen, you can find it by tapping a button in the app which makes the pen beep (as long as it’s in and in range of course). Software. The hardware is fantastic, and the paper is, well, paper. But the app is cheesy and feels like exactly the kind of thing a dull corporation would come up with, full of bad UI decisions and ugliness. Pages, for instance, are viewed in a scrolling view, unlike the actual pages they mimic which are, of course, turned a page at a time. And while you can read the pages just fine in the main view, you need to switch to a different mode to do any editing, or to listen to your recordings. “Feed” is the name given to the editable view, and it shows your notes split into seemingly arbitrary sections – sometimes into single lines, sometimes into paragraphs. If you swipe these sections to the left, you can delete them from the feed view, but they remain in the regular page view. Swipe to the right and your handwriting is magically transformed into actual text, which is pretty great. And from there you can tag these chunks of text, or turn them into tasks, or share them via the usual sharing methods. The problem is, it’s so bad it’s like using Windows. You never quite feel like you know what’s going on. Then we get to the “pencasts” view. Which is grayed out as an option unless you are currently looking at a page where you wrote whilst recording. In this view you an do the cool random-access thing to listen to any part of your recording. But what if you made a recording and didn’t actually write anything? Then you have to leave this view, go back to the main menu and find the other pencasts section, which shows recordings titled with the date they were made. And search? Again, go to the main menu (by closing out of all the things you’re currently doing) and then tap the search field at the top of the list. You don’t actually get to type in here, though: as soon as you tap it you’re taken to a search bar at the top of the standard notebook view. Why on Earth couldn’t this be revealed by pulling down on the main page, like happens in every other app with search? Worse, if you deleted a section using the “Feed” view above, then it won’t be returned in your search, even though you can still see it on the pages of your digitized notes. So if you erase something, you’d better remember you erased it, because otherwise you’re in for a whole world of frustration. The pen, then, is great, as is the accuracy of its digital rendering, and the reliability of the whole setup. Robust is the word I’d use. The search, too, is surprisingly accurate, even for my scrawl. But the app used to access all this is so bad it actually puts me off the hardware. 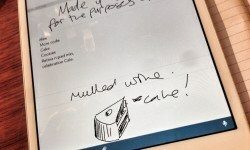 After all, why bother with the Livescribe at all if the app is so terrible? Sure, it’s nice to be able to search your notes, but you could just write on regular paper and feed the sheets into Evernote via your iPhone’s camera, giving you search and a way nicer app to do it in. I hope for an update to the app that’s as drastic as Evernote’s recent change of direction. Without it, there’s not much point buying this pen. Which is a shame, as it really is a great way to combine the worlds of paper and bits. Currently, the best workaround seems to be to use the pen, but to just sync it and then send the pages to Evernote or another PDF-compatible app of your choice for actual precessing. Product Name: : Livescribe 3 SmartpenThe Good: Excellent pen, robust setup, great search. The Bad: Awful, awful app. Almost unusable. The Verdict If you love Windows and like frustrating apps, buy it. Otherwise, despite the excellent hardware, the software ruins everything.